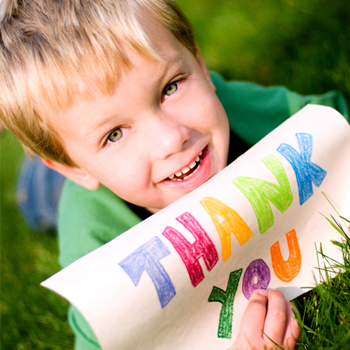 Teaching your kids manners takes repetition, modeling and reinforcement. Nothing about good parenting comes easy, free or cheap. Yesterday a young visitor shook hands when we were introduced. “Wow, a firm grip and you’re looking me square in the eye,” I said, returning the courtesy to the 15-year-old. I turned to his parents and said, “Nice job. He knows how to greet people. My brother Jim taught me a long time ago, Firm grip and square in the eye.” This simple gesture says, “I care about how you feel.” That’s the essence of manners. I agree. Don’t go overboard, either like a manners cops, demanding a please-and-thank-you every other minute. All I ask is for kids to make eye contact and pleasant conversation; to unobtrusively say, “No thank you” if they don’t something; and to chew with their mouths closed. Like most good parenting habits, teaching manners requires role models, repetition and reinforcement. Family dinner is an ideal place to model, repeat and reinforce consideration for each other and the cook. It’s not a chore to teach manners, it’s a practice. Hungry from swimming, she accepted. I put some frozen bread in the toaster and got out the peanut butter and jelly. She assembled it, said, “Mmm. Good jam!” and ate it unobtrusively. That’s my kind of kid. Appreciative, asked nicely for what she wanted, and accepted what was offered. She showed good home training. Manners are like exercise — do regularly for the best results. And keep at it. 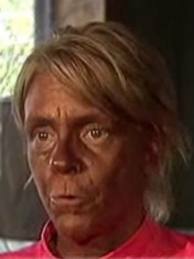 Patricia Krentcil, the famous tanning mom who is charged with child abuse because her 5-year-old daughter got sunburned. I feel empathy for Patricia Krentcil, the tanning mom charged with child abuse because her 5-year-old red-headed child came to school with a sunburn.The authorities over-reacted to Patricia Krentcil’s bad example for her five children. Since when is a sunburn is considered child abuse? If anything, the tanning salon is guilty of negligence for allowing a 5-year-old into a tanning booth. If that happened at all. Mom says the kid stayed out in the sun too long.As the mother of four children, I understand the need for parental self-indulgence, and the results of insufficient “me-time.” I became cranky, depressed and resentful when I spent little time and money on me. With five kids, hiding away alone in a tanning coffin sounds like much-needed peace-of-mind for Patricia Krentcil. All caregivers can benefit from “me time” to make us better parents and keep the marriage going — in activities that aren’t self-destructive. Tots-to-teens can see through parental hypocrisy of, “Do as I say, not as I do.” Tween and teens abhor hypocrisy and will call parents on it. Kids absorb unspoken messages when we tan until we bake, drink until we fall down, smoke until we hack, and eat until we waddle. When kids witness addictive behavior in action, they’ll feel the impact for the rest of their lives. They’ll understand addiction as something to turn to in times of despair and depression. They’ll experience the anger, helplessness, disappointment and frustration of addiction in those they depend on. They’ll either see addiction as inevitable and acceptable or an evil to be avoided. The real message from The Tanning Mom is parents need a break from their kids, that sets an example worth imitating. Love the action in this photo as well as the reflection in the windows. Appearances can deceive. This 9-year-old is gaining self-confidence, skill, self-discipline, self-esteem and connection to her family. 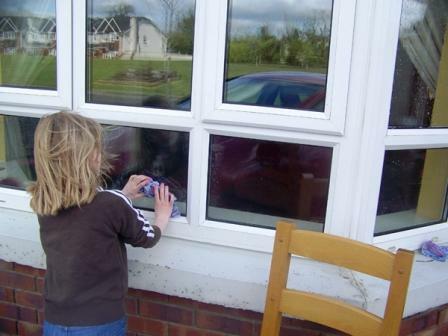 This post is from a mom in Ireland who read “Raising Able: How Chores Empower Families” and began applying the practices with her two kids. Somebody tell Hallmark that we already had mother’s day. It was a few weeks back. We started family meetings in January. We have had a weekly family meeting for three months. As a family, we have cleaned out the shed, scrubbed the carpet, and had a stall at a carboot sale [flea market]. The children have cleaned the bathroom, washed windows, hoovered, worked a huge amount on the dishwasher, washed the dogs, brushed the dogs, cooked frozen sausage rolls with no help, lit the fire, made firelighters, and swept the floor: All since we began chores. 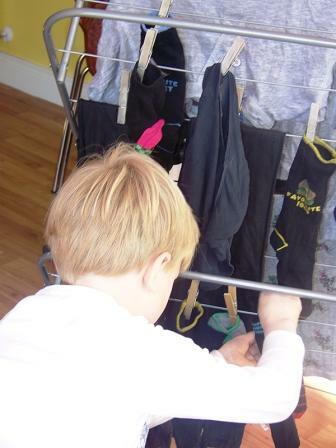 Hanging out the laundry instead of hanging out with his friends brings priceless self-discipline and counteracts entitlement. We have gone bowling, had lunch in various venues, made trips to the playground, played cute family games of hide and seek, become expert at Connect 4, and even camped for one night in April in Ireland.The children have learned to work together and to enjoy their jobs. It was a joy to see my son busy with the hoover [vacuum cleaner] and singing a song. He seems to particularly enjoy telling the boy next door that he can’t come out now because he has his jobs to do! My daughter is 9, and she had never really done chores before. I explained to her that I needed her help, and that she had to work for our family the same way as the rest of us do. She likes when I work with her. She now tells me more about her feelings and her life. She seems so much happier since we put her to work. She likes to tell me that other girls are princesses. We are not princesses, we are women who are useful and the dad in our house likes us just the way we are. As a parent, family meetings are hard work. It is totally worth the trouble. We are so much more together as a family, and I wouldn’t have missed that game of hide and seek or seeing that baby lamb at the campsite, for all the tea in China. “Raising Able” has given me the ideas and skills to make memories my family will always cherish. Thank you Susan. This little guy proves that cooking is not a chore. Combining ingredients and transforming them into something delicious is an adventure that brings pleasure to family members. 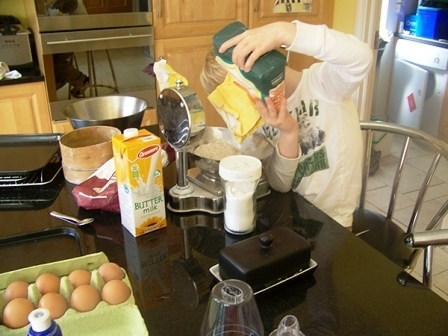 It will require parents to allow kids to make a mess in the kitchen. Go with the flow! 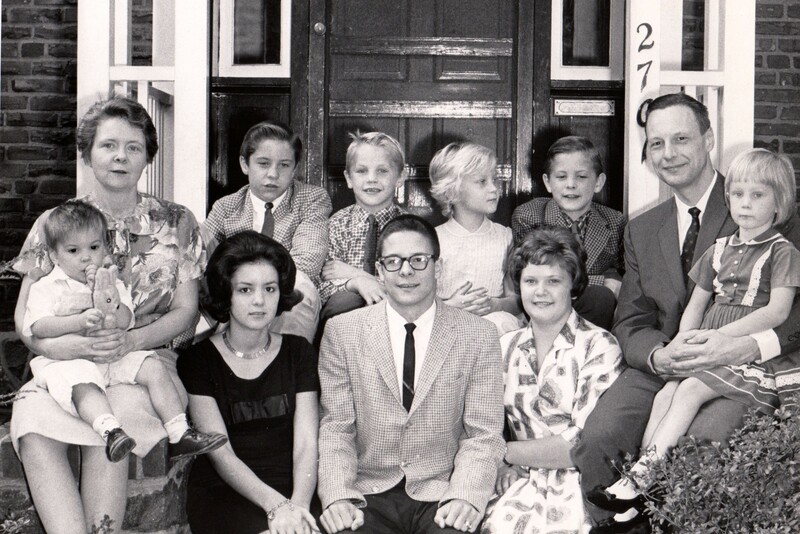 Our family in 1962. I’m sitting on my father’s lap in this annual holiday photo tradition. No matter what your relationship with your mother, you will miss her when she dies.The ache is doubled if your mother was like mine, with whom I felt connected, accepted and respected. Mildred has been gone for six years now. I still want to call her when I feel up or down.Motherhood for Mildred was not about if her children made her look good or feel good. I never remember her saying, “I’m proud of you.” Her objective was not how she felt/thought/looked about us, but how we felt/thought/looked. 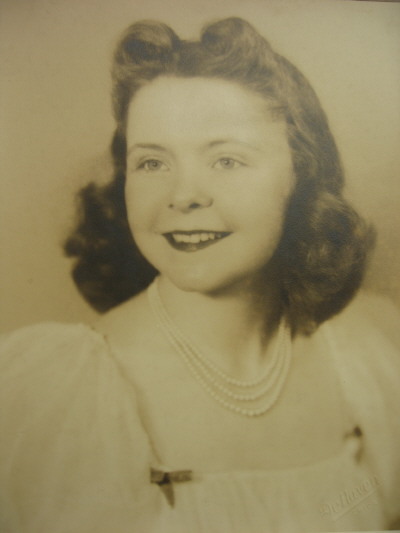 Mildred Mary Margaret Theresa Rees Tordella, 1921- 2005. Mother of nine, grandmother to 25, great-grandmother to 11 and counting, and friend to countless. Parental pride/praise sends the silent virulent message of, “I love you best when you make me look good and feel good. Don’t let me down.” Praise and pride can motivate children to achieve for parents. One unfortunate outcome of parental pride is for a young person to choose a career parents want, which eventually lands them in the psychiatrist’s office, miserable. Without the risk of “letting Mom down,” it freed me to call her when I had been fired from a job, yelled at my kids or fought with my spouse. She held me in failure and celebrated my joys. I long to call or visit her one more time, to bask in that kind of connection, acceptance and mutual respect. Mom in her early 20s. My parents never referred to their posse of grown children as “the kids,” a common practice, often justified because “You’re younger than us.” Yuck — what a barrier that sentiment erects. One of the most difficult aspects of motherhood is knowing and seeing we are setting up lifelong habits and forming personalities. Ugh! What a responsibility — and opportunity. My mother mastered the art of encouragement. She stayed out of our way and let us find our own way. Five of us have our own businesses. We all have high degrees of internal motivation, thanks to the chores we were expected to do, that taught us self-discipline. Mildred specialized in listening with an open heart and asking questions. Questions pointed my needle in the right direction.”What do you think? How did that happen? What are you going to do next?” I trusted her to listen objectively, not make me wrong, or risk disappointing her. When whining about my marriage [what marriage is perfect?] she inevitably sided with Bob, much to my annoyance. She was usually right, too, because I had failed to manage my emotions around whatever petty annoyances. Even though her parents had been dead for years, Mildred often said, “My parents are with me every day.” I scoffed at that sentiment when she was still alive, and like much of her wisdom, I’ve come find out she was right. Mom, you’re with me every day. Thanks for everything. I love you and miss you. You are currently browsing the Raising Able Children: how to nurture capable confident young people weblog archives for May 2012.